This tool was created to combat the complexity of debugging storylines in Westerado: Double Barreled. It monitors the state of a game of Westerado in a number of ways. In Westerado everything is determined by designer controlled variables, created by the designers in BloXcrypt and Gunversationist. This means that in any game of Westerado the number of variables used and what their names are can be completely different and is mostly determined by what actions the player decides to take. This led to a lot of situations where we knew something was going wrong with something related to what had been done before, but it was very hard to pinpoint the specific point where it happened. 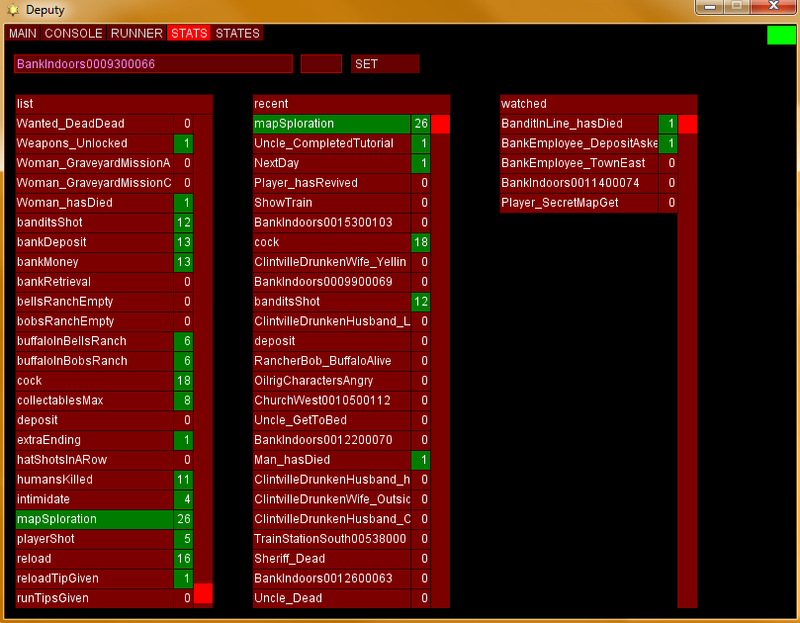 Deputy collects all states of these designer controlled variables and monitors them throughout the game. It shows these variables with their states in 3 different lists: alphabetized, recent and watched. The alphabetized list is just that, an alphabetized list of all the variables in the game. The recent list is comprised the last 100 variables that changed, sorted by the time of their last change. Right-clicking a variable name in either of those two lists adds it to the watched list, so the designer doesn’t have to worry about all the other information once he knows what he is looking for. Any variables that change also temporarily change color to draw your attention and indicate the value has changed. The value field can also be 2 colors, red for 0 and green for anything else, since 0 or something else was usually the most basic thing that was checked.